“There’s still some living left when your prime comes and goes” goes a lyric from a song by Jimmy Eat World. It’s perfectly applicable to the 2013 Infiniti G37x sedan we tested. In production since 2007, the G37 is showing a bit of age these days. But with age brings character and the G37x has plenty of it. Despite being a near-geriatric in car years, we can fully recommend the car from both an enthusiast and value-based perspective. Equipped with a 3.7L V6 engine producing 328hp and 269 ft-lb of torque, he G37x hits 60mph in about 5.3 seconds. On the way to 60mph, an initially pleasant exhaust note is present from 1,000 - 5,000rpm but quickly turns raucous near the 8,000rpm redline. Grandpa doesn’t like to be pushed too hard. But, he does know how to have fun. While the engine may not sound perfect at all RPMs, it has ample power to hold you and your fellow travelers to their seats under hard acceleration. The base suspension will keep you comfortable the whole way to work but will also happily play when you happen to take the back roads home. The all-wheel drive guarantees minimal slippage around the curves. A seven speed automatic transmission is the only option on the base and technology package equipped cars. Enthusiasts can rejoice, though, as a six speed manual is available in the sedan and coupe cars equipped with the sports package. The interior of the car is well-appointed, with supple leather seats, leather arm rests, and soft expensive feeling plastics. The car is also equipped with nice standard features - even compared to new cars in 2017 - with a back-up camera, a smart key, push buttons start, and heated seats. A purple-ish blue lighting highlights the center console and display gauges which adds a original but refined cabin feel at night. They say refinement comes with age, and we doubt this car would disagree. The 7 inch center console, however, has outstayed its welcome. Seemingly from the mid-2000s, the LCD screen displays a low resolution with little color variety and doesn’t even have a digital clock. The LCD isn’t a touchscreen either, which means it has to controlled from the dial or buttons below it. Thankfully, most actions can be done through hard buttons, and the center console is most useful displaying the dismal fuel economy you’re getting (rated at 17mpg in the city) from flooring the engine. At least your shenanigans will look good to onlookers. The exterior of the car has elegant flowing lines and feels buttoned up. There are no sophomoric brake vents, hood scoops, or enlarged intakes. Instead, a chrome trunk lip spoiler is the only sign of flash. The hood opens to a well-covered engine bay, but allows for easy access to the dipstick and other common maintenance ports. Older doesn’t have to mean worse. In the case of the Infiniti G37x, older means more refined, professional and sophisticated. With ample power, a poised chassis, professional looks and great standard features, the G37x should be on the shopping list of any enthusiast looking in the used car market. Rear timing gasket leak ($3,000): A gasket leak can develop in mid-mileage 2009 - 2010 G37 cars. A transportation safety bulletin was released for this issue so most affected cars should have been repaired under warranty. 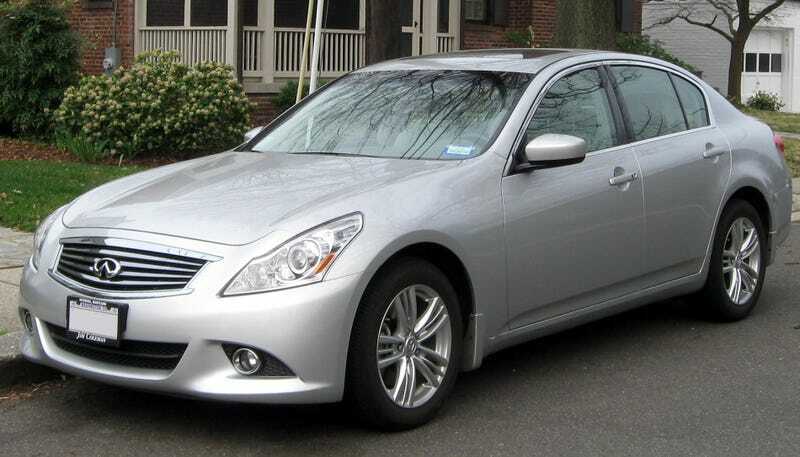 Catalytic converter ($2,000): The catalytic converter in 2009 - 2010 Infiniti G37x cars sometimes needs to be replaced. We recommend picking up a lightly used 2011 G37, avoiding the potential rear timing gasket leak issue and the catalytic converter replacement problems. Low mileage examples of the G37x can be found for under $18k as of 1/10/17. Examples equipped with a sport package and a manual transmission can be had for $20k. Although the G37 was produced in significant numbers, adding to potential future depreciation, its value and wide array of standard features help keep demand propped up. We expect future depreciation of a 2011 G37 to hover right around 7% per year. Like what you’ve read? Visit us at Pray for Cars or like us on Facebook for the latest car reviews, stories and more.